This early chest of drawers was known as a 'chest on chest'. Drawers had been fitted into Catalan bridal chests, Spanish and German writing cabinets and European travelling chests since the early 16th century. However, by the mid 17th century, chests of drawers gradually replaced ordinary chests, with no drawers, as their convenience for storing clothes, blankets and other textiles became more apparent. The engraved ivory and mother of pearl decoration is found on gunstocks of this period. These materials had been used on Spanish, Neapolitan and Netherlandish furniture since about 1600. 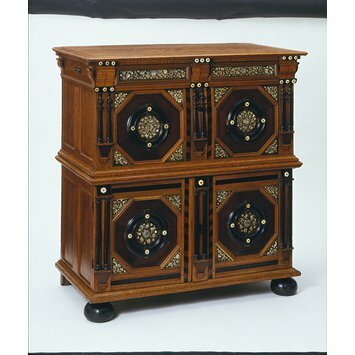 Cupboard or Chest with drawers, oak, inlaid with ivory and mother-of-pearl, partly veneered with ebony and other woods. Above is one long drawer, below is a deep drawer, while the lower portion opens in two doors enclosing three drawers. 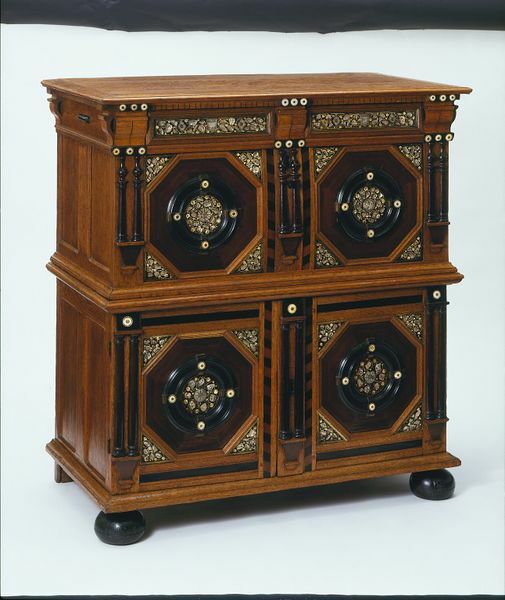 The fronts of the deep drawer and of the doors have circular applied mouldings within octagons; the corners and the centres of the panels inlaid with ivory and mother-of-pearl; the top drawer is also inlaid and bears the date 1653; the uprights of the framework are decorated with pairs of split balusters. In front are flattened ball feet, the back feet are rectangular. Object sampling carried out by Jo Darrah, V&A Science; drawer/slide reference 1/59. Bought for £52.10s from Lieut. Col. H.C.Mathew, Langer House, Felixstowe. From catalogue H. 4 ft. 4 in., W. 3 ft. 10 in., D. 2 ft.
WINDISCH-GRAETZ, Franz: Mobel Europa. 2. Renaissance-Manierismus (Munich, 1982) FW7 C 6,7. Edward Joy. Antique English Furniture (London: Ward Lock Ltd, 1981). BADA Yearbook 2001/2, fig 8 & 9, p 13. Lee Jonathan, 'Decorative Cabinets of the Commonwealth', Apollo Magazine, 2.54, p 42-43. Identification of timbers used: oak (substrate), with cherry (split furnings), and veneers of bog oak, ebony (<i>Diospyros ebenum</i>), ivory, snakewood (<i>Piratinera quiansensis</i>), brass and mother-of-pearl. Bog oak used for areas of more intricate cutting or moulding.